Movies is an entertainment app by Flixster that allows you to have all the info about current and upcoming movies (both in the theatre and on DVD) at your fingertips. There are 5 sections to the app: Box Office, Theatres, Upcoming, DVD, and My Movies. When you open the app, you are automatically directed to the Box Office section. 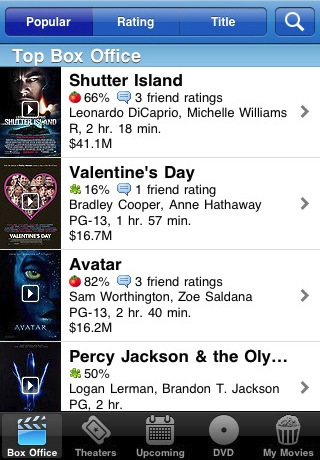 This shows you all the films opening this week, the top box office films, and other movies also currently in theatres. Each film has a rotten tomatoes rating next to it, along with the big name actors in the film, the rating, the running time, and sometimes other information like the date of release or how much money the film has grossed so far. If you tap on one of the films, you are taken to a screen with a ton of options. You can play the trailer, get showtimes, add a user rating of your own, view photos from the film, read a synopsis, go to info pages about the cast member of your choice, look at critic reviews, and look at Flixster user reviews. Basically anything you want to know about a film is available. The cast info pages have pictures, a biography, birthday, birthplace, and a filmography. The theatres section uses your current location to show you the closest theatres to you. When you tap on a certain theatre, you are taken to an info screen that shows the theatre’s name, phone number, nearby restaurants, nearby nightlife, and showtimes. Everything you need to make a plan for a full night out. The upcoming section shows all the movies that are coming out soon sorted by date. Same with the DVD section, except obviously that section is for movies coming out on DVD soon, not in theatres. In the my movies section you can see all the movies that you’ve marked as “want to see,” movies you’ve rated, recent friend ratings, take movie quizzes, get top actor info, adjust settings, tell a friend about Movies by Flixster, and link yourself up with Facebook, Flixster, and Netflix. If you want to search for a movie that you don’t see in any of the sections, just tap the magnifying glass icon at the top right hand corner of the screen. Movies is easy to use, full of information, and has great quality photos and videos. Best of all, it is FREE! Why wouldn’t you add it to your app collection today? Then next time you want to know something about a movie, all you have to do is pick up your device. The app works on both the iPhone and iPad as a universal binary. 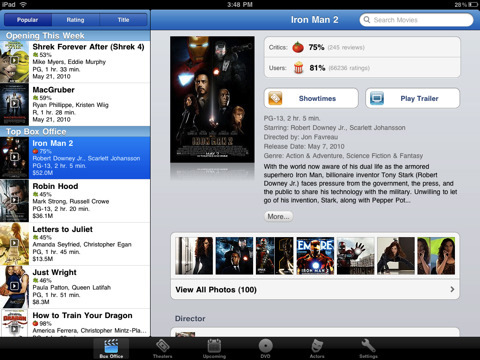 AppSafari review of Movies by Flixster was written by Tyne Kennedy on July 2nd, 2010 and categorized under App Store, iPad apps, Local, Movies, Reference, Universal. Page viewed 5670 times, 1 so far today. Need help on using these apps? Please read the Help Page.